Via the National News Watch, “Prime Minister Stephen Harper is speaking out for the first time on Toronto Mayor Rob Ford — and keeping his tongue planted firmly in his cheek. Harper jokes that he’s heard Ford say publicly he wants to be prime minister, a notion Harper says he clearly can’t support. 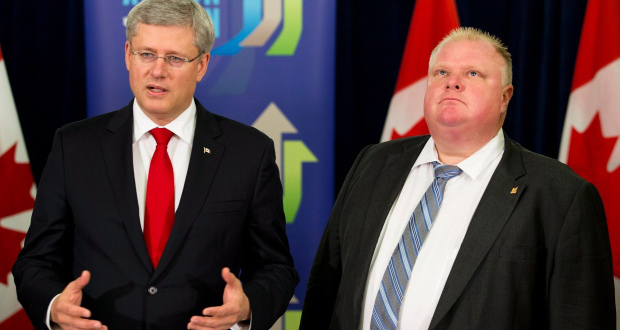 But when it comes to the Toronto mayor’s future, Harper says that’s for the voters of that city to decide. Harper says the Conservative government’s position is clear: there are strict drugs laws in place, and no one should be buying or using illegal drugs, especially sitting politicians. Ford’s admission to having smoked crack cocaine “probably in one of my drunken stupors” made him a target of international ridicule and resulted in his being stripped of most of his mayoral powers. The Conservative government has said little on the controversy, however — in part because the Tories have previously allied themselves with the popular, straight-talking mayor. “I’ve heard Mr. Ford’s statements to the effect that he would like to become prime minister of Canada; obviously this is not something I’m in favour of,” Harper said at a news conference in Lac-Megantic, Que.